Microbes rarely exist as single species planktonic forms as they have been commonly studied in the laboratory. Instead, the vast majority exists as part of complex polymicrobial biofilm communities attached to host and environmental surfaces. The oral cavity represents one of the most diverse and well-studied polymicrobial consortia. Despite a burgeoning field of mechanistic biofilm research within the past decades, our understanding of interactions that occur between microbial members within oral biofilms is still limited. 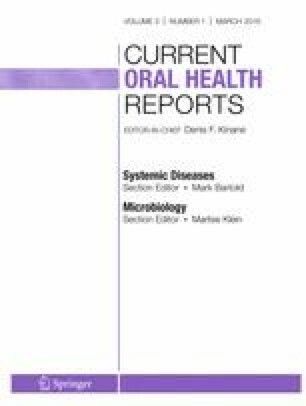 Thus, the primary objective of this review is to focus on polymicrobial biofilm formation, microbial interactions and signaling events that mediate oral biofilm development, consequences of oral hygiene on both local and systemic disease, and potential therapeutic strategies to limit oral dysbiosis. Hubertine ME Willems, Zhenbo Xu, and Brian M Peters declare that they have no conflict of interest. Kharlamova N, Jiang X, Sherina N, Potempa B, Israelsson L, Quirke AM, et al. Antibodies to Porphyromonas gingivalis indicate interaction between oral infection, smoking and risk genes in rheumatoid arthritis etiology. Arthritis Rheum. 2015. doi: 10.1002/art.39491. Findings from this associative clinical study suggest that the periodontal pathogen Porphyromonas gingivalis drives production of anti-citrullinated protein antibodies (ACPA) linked with rheumatoid arthritis. Schlecht LM, Peters BM, Krom BP, Freiberg JA, Hansch GM, Filler SG, et al. Systemic Staphylococcus aureus infection mediated by Candida albicans hyphal invasion of mucosal tissue. Microbiology. 2015;161(Pt 1):168–81. doi: 10.1099/mic.0.083485-0. Findings from this study revealed that the under-represented oral colonizer, Staphylococcus aureus, can utilize the invasive hyphal filaments of the common oral fungus Candida albicans to disseminate and cause lethal systemic staphylococcal infection in a murine model. This study builds on the growing appreciation for fungi and bacteria to interact in vivo, often resulting in infectious synergism.